Holy. Monday. Where in the hell did the weekend escape to? I feel like today should be Saturday, but I assume that is my delusion rearing its ugly head. Did we all have a fabulous weekend? I will tell you how I spent mine, assuming that you care. I spent all night and day of Friday cramming for an exam I had early Saturday morning. I spent Saturday morning trolling the city for goods. I hit up my favorite gold mine for items, Habitat for Humanity. I have to tell you, if you do not shop here, you are missing out my friends. I found a ginger jar that I could not live without that had a price tag of $1.00. Now for those of you who know me, and those of you who don't, I never carry cash on me. Never. (Even though I now live in a city that has a toll system, I cannot get it through my head that I need to carry cash. I actually had to engage in an IOU at one of the tolls this weekend, I kid you not.) Of course the minimum for a credit or debit card purchase at the Habitat Store is $10. Oy. I about left the store in a fit of defeat until this kind man paid my debt, on instruction that I come back to shop there. Done and done. I know it was a $1.00 folks, but I was overwhelmed by his kindness. After all, I could not live without this ginger. And he knew it. Which brings us to the subject at hand this morning. Gingers. Ginger jars. Let me just tell you. 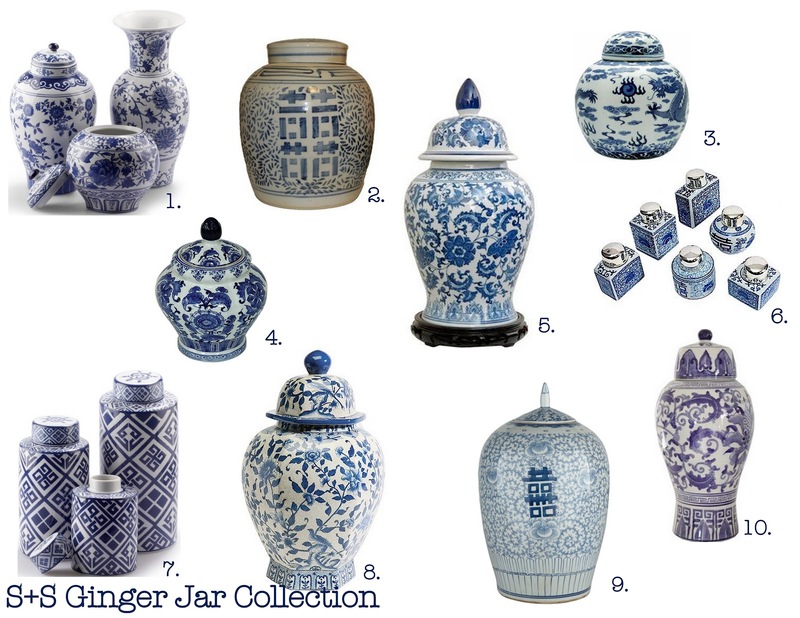 I have been adding to my blue and white ginger jar collection for some time now, but the stakes have just gotten extremely high. For some reason, I am hot on an obnoxious collection of these beauties. There is something so classic yet so whimsical about these ceramic jars. I feel like their individual and unique patterns all tell some kind of story. What that story is, I have no clue. But I bet it has a damn good climax. Let's take a look at some obnoxiously awesome ginger jar collections. This is what my brain looks like on ginger jars. I love this space and adore each and every blue and white ginger piece up in here. Such a classically fabulous vignette. 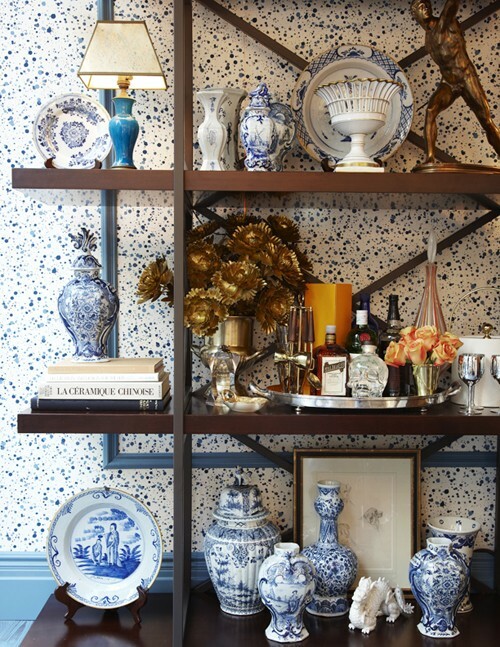 Who is loving these two blue and white vases that are adding a splash of color and pattern to the space? I spy a few of blue and white happenings in this space. This room has such a simple and clean feel that the only accessory that would make any sense to me would be a plethora of gingers. No. Not the kind you are thinking. Lovely collection of all things ginger. The plates add a mixed element here as well as the bronze accessories. Off topic, but that bronze flower number is amazeballs. The one. The only. Jamie Meares. We are all incredibly familiar with this image, but it couldn't help but make the lineup today. Jamie knows how to work a ginger jar collection like no one's business. Jamie is my ultimate design crush. 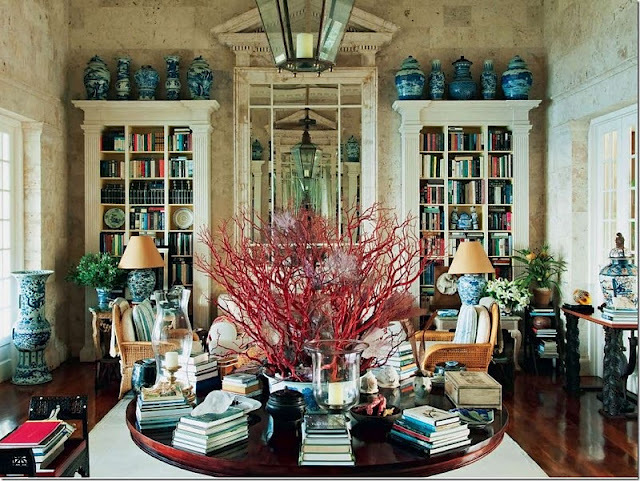 The mixture of reds and greens with the classic blue and white ginger jars absolutely sets me over the edge. Lovely splashes of ginger here and there. One of my favorite dining rooms of all time. All time. Partly to do with that light fixture. Partly to do with the furniture. Mostly to do with its ginger jar collection. This is my kind of tablescape. I knew we were meant to be. I am so obsessed with ginger jars right now! Every time I go to my parents house I think about swiping a few. My mom has been collecting them since college so I feel certain she wouldn't notice a few missing pieces. I cant believe you made it to habitat. I must go!!! We are so meant to be!!!! I feel your pain. I am a ginger jar addict as well. I need to seek help. My mom just gifted me with one of her old ginger jars (looks just like number 2) and it has created an obsession with me! I NEED more!! Add to it!!!! Misery likes company! Ummmm I'm so jelly!!!! While I was getting lame dolls you were getting an entire ginger collection built for you!! 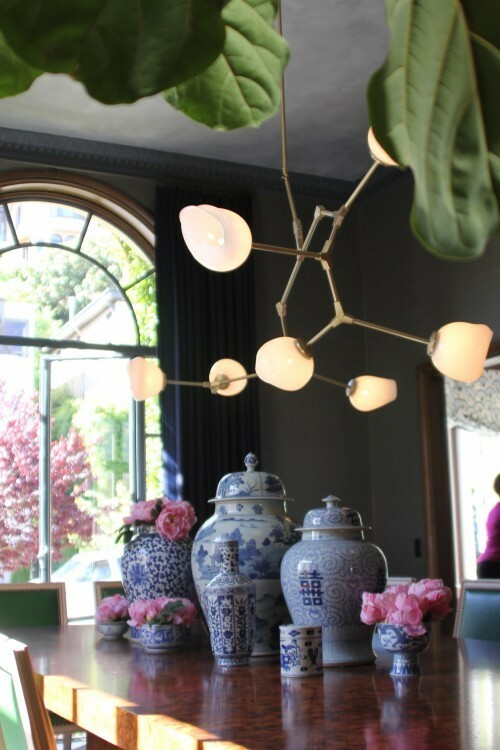 If you see all my posts on blue and white and porcelains, I LOVE everything in your images. I have a large collection of porcelains, and never have enough! I have picked them up over the years for practically nothing. I love that built-in from Lonny magazine. I love those bold peices too! Im obsessed with them (and I;ve been posting on them over and over again recently). It seems they are hard to find but this is a great round up! I wanna see the one you got! Loving these ginger jars! 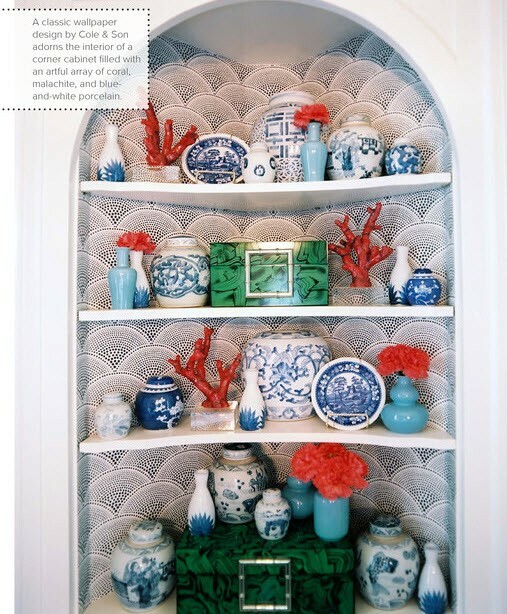 The coral and blue layout- yes please! 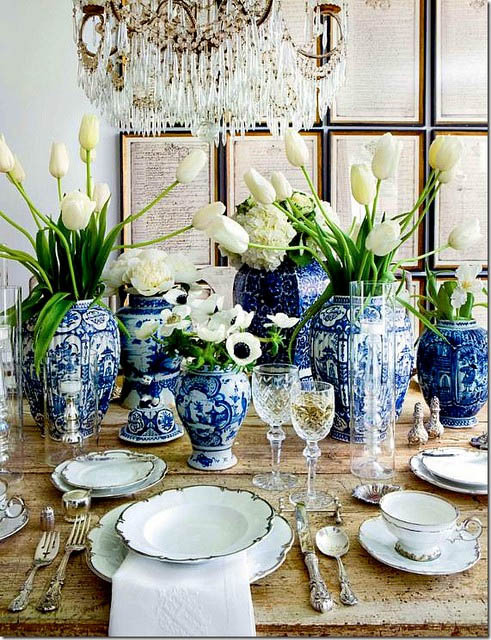 I've always loved blue and white pieces like these... 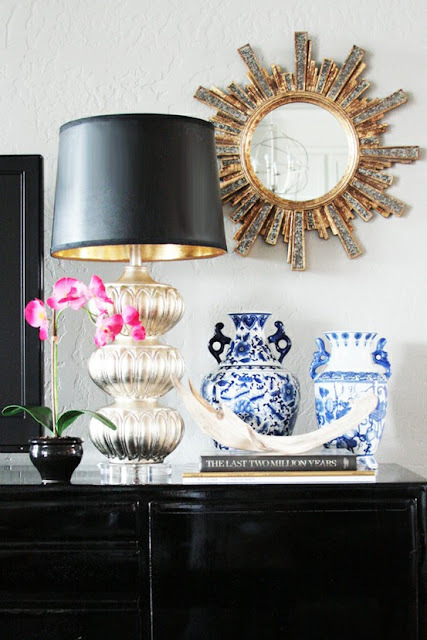 They are timeless (and therefore currently being used to decorate my living room!) Love the images you chose here. Love the ginger jars! I love the addition of the red/green/coral! I need one of these now! Thanks for sharing. After reading this post, I am questioning my sanity as I currently own no ginger jars! Clearly, I need to rectify this STAT! Damn now I want a freaking ginger jar. 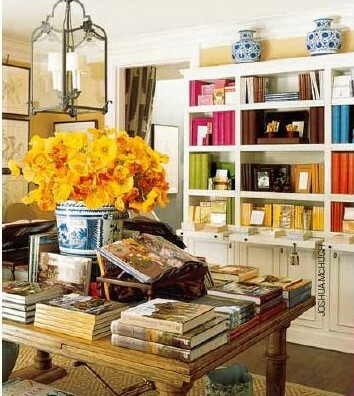 Habitat stores are the best- little secret I buy my coffee table books there. If you take off the nasty covers they look chic sitting in stacks around your house. You are welcome for that secret friend! I am so impressed by you! $1?! You are amazing. Love! This is a recent obsession of mine so my collection is small but growing! A $1 ginger jar!? That alone makes for a perfect weekend! I thought I did good when I got mine for $3 at our local thrift, but $1 takes the cake! I love it! Especially the ones above the book shelf, they look great up there. Great blog!